In 2008, the Australian Government sent their customs vessel, the M/V Oceanic Viking, to the Southern Ocean Whale Sanctuary to document the operations of the Japanese whaling fleet. What they saw has been hidden from the public eye, until now. Despite a global moratorium on commercial whaling in 1986, Japan has been killing whales in the Southern Ocean in the name of “scientific research” since 1987. In 2008, the Federal Court of Australia deemed Japan’s whaling illegal, yet despite this, their whaling fleet headed south that year without any prosecution from the Australian Government. In 2014, the Governments of Australia and New Zealand took the Government of Japan to the International Court of Justice (ICJ) in the Netherlands where their Southern Ocean Whale hunt was deemed illegal. The Japanese Government continues to send their whaling fleet to the Southern Ocean each Austral summer, with a redesigned program and self-imposed quota to kill 333 protected Minke whales each year. Cape Adare in east Antarctica. Taken from the M/Y Steve Irwin during Operation Relentless in 2014-2015 when patrolling the Southern Ocean Whale Sanctuary. Antarctica is the highest, driest, windiest and coldest continent in the world. Covered almost entirely by an ice sheet, hiding a landscape of valleys, mountains and plains, temperatures have bone-chillingly dropped to - 89.2 degrees Celsius – the lowest ever recorded temperature on the planet. Due to the frigid conditions, thousands of glaciers extend into the sea. On the coast, great pieces of ice break away and drift as icebergs. During winter, the surrounding sea freezes for hundreds of kilometres. During Antarctic Whale Defence Campaigns, Sea Shepherd ships have always needed to be extra vigilant for icebergs such as this massive beauty when cautiously sailing through the icy Southern Ocean. 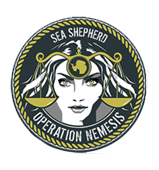 This was taken during Operation Nemesis in 2016-17. The seas are cold. Temperatures vary from around −2 to 10 degrees Celsius, and it is stormy. Cyclonic storms travel east around Antarctica, intensifying because of the temperature contrast between ice, the open ocean and the lack of landmass to act as a windbreak. The strongest winds ever recorded anywhere on earth have blown through the Sanctuary, which creates some of the largest waves – averaging between 20-30 feet – in the world. Marine wildlife is abundant in the area. Antarctic krill is the keystone species of the ecosystem of the Southern Ocean, and it is krill that attracts most whales to the region. Most whales of the Southern Ocean migrate to warmer waters for the Antarctic winter to give birth. From the deck of the M/Y Steve Irwin, a large swell kicks up during a fierce storm in the Southern Ocean. Waves around the continent of Antarctica can reach up to 20-30 metres with cyclonic-force winds. Antarctica is truly one of the world’s last great wildernesses. They return south in the Austral spring, to rich feeding grounds, and remain in the safe haven that is the Southern Ocean Whale Sanctuary throughout the summer. The Southern Ocean Whale Sanctuary is an area of 50 million square kilometres surrounding the entire continent of Antarctica where the International Whaling Commission (IWC) has banned all types of commercial whaling. Despite a ban on all whaling in the Southern Ocean Whale Sanctuary, Japan’s Whale Research Program continues to hunt Minke whales in the Sanctuary. over 6000 whales have been saved from Japan’s deadly harpoons. Led by Captain Paul Watson, the crew of the Farley Mowat set out to hunt down the Japanese whaling fleet in the Southern Ocean Whale Sanctuary and in doing so exposed Japan’s JARPA II Whaling Program’s illegal activities to the world. The whalers were able to change plans and avoid Sea Shepherd but in doing so Sea Shepherd learned a valuable lesson: aerial surveillance increases the chance of success when tracking the Japanese whaling fleet. Sea Shepherd’s second campaign to oppose illegal whaling in the Southern Ocean saw the M/Y Farley Mowat, Captained by Paul Watson, pursue the Japanese whaling fleet for six weeks. The whaling fleet was located on December 22 and fled from their chase. On Christmas Day, the Japanese factory ship, the Nisshin Maru, was intercepted by Sea Shepherd and fled as a result. The chase continued into January 2006, covering over 3000 miles along the Antarctic coast. On January 8, the Farley Mowat once again approached the Nisshin Maru and deployed defensive lines. The ship stopped its whaling activities and fled. Throughout the campaign, the Farley Mowat completed a 50-day voyage covering 8,500 miles and the Japanese whaling fleet was disrupted for 15 days and prevented from achieving their quota. The first Antarctic Whale Defence Campaign to involve two ships, the M/V Farley Mowat, and the M/Y Robert Hunter, a Hughes 300 helicopter (called the Kookaburra). 56 crew members represented 14 different countries. In a controversial tactic, two Sea Shepherd crew boarded a Japanese harpoon ship and were detained for three days before eventually being released. The Japanese Coast Guard threw concussion grenades and fired upon the Sea Shepherd crew of the newly named M/Y Steve Irwin. The campaign concluded with over 500 whales saved and the Japanese whaling fleet suffered huge financial losses. Operation Migaloo was the first campaign to be documented by a film crew from Animal Planet who chronicled the campaign for the television series Whale Wars for seven seasons. Operation Musashi began when the M/Y Steve Irwin departed Brisbane, with an international volunteer crew of 48, and headed for the Southern Ocean Whale Sanctuary. The Steve Irwin chased the Japanese whaling fleet for 3,200-miles severely disrupting the hunt and saving over 300 whales. A fleet of three vessels set out on Operation Waltzing Matilda in January 2010. During the campaign, the Japanese harpoon vessel, the Shonan Maru No. 2, deliberately rammed and consequently sunk the Ady Gil. For three weeks straight, not a single whale was killed. Operation Waltzing Matilda saved the lives of 528 whales and cost the Japanese government tens of millions of dollars. During Operation Divine Wind, Sea Shepherd’s eighth Antarctic Whale Defence Campaign, the Brigitte Bardot, Sea Shepherd’s newest vessel, was damaged when a rogue wave hit the pontoon and was forced to return to port early for repairs. Even with just two ships, and some of the worst weather Sea Shepherd crew ever experienced in eight seasons in Antarctica, the Japanese whaling fleet was still forced to go home early saving 768 whales. Operation Zero Tolerance was our largest campaign with more than 120 crew from 20 nations on board four vessels: the Steve Irwin, Bob Barker, Brigitte Bardot, and the newest vessel to the fleet, the M/Y Sam Simon. The Japanese whalers escalated their attacks on our crew and three of our ships were damaged after being rammed multiple times by the 8,000 tonne Nisshin Maru. Our crew also endured ongoing attacks by concussion grenades and were hit with high-powered water cannons. Despite all the hardships thrown our way, and spending more than 4 months at sea, we returned home knowing that without us hundreds of whales would have been illegally slaughtered. During Operation Relentless we located the Japanese factory vessel, the Nisshin Maru, on a record four separate occasions. The whaling fleet’s operations were severely hampered by our continued pursuit, which included twice exposing the whalers in the process of butchering protected Minke whales, poached from the waters of the Southern Ocean Whale Sanctuary. Our flagship vessel, the M/Y Steve Irwin, with Captain Wyanda Lublink and 35 crew from six countries was joined by our newest patrol vessel, M/Y Ocean Warrior, with Captain Adam Meyerson and 14 crew from eight countries, to once again stop the Japanese whaling fleet from illegally slaughtering whales in an internationally-recognised whale sanctuary under the guise of “scientific research”. The Japanese whaling fleet took three solid months to kill 333 whales. This averages out to 111 whales killed per month compared to 345 whales killed per month prior to Sea Shepherd’s involvement. Read from Rachael Clemens, a Sea Shepherd On-shore Volunteer in Queensland, who wants her Member of Parliament, Border Defence Minister Peter Dutton, and Prime Minister Malcolm Turnbull, to use their political powers to defend the whales. I grew up on the east coast of Australia and every year my parents would take me whale watching. I have been incredibly blessed to be part of a generation that has seen the increase of the Humpback’s population numbers over the past decade, due to the end of commercial whaling, and will continue to fight for future generations to be able to witness the same. After viewing the Australian Customs footage, I was shocked at the straight-out barbaric nature of seeing the explosive-tipped harpoon piercing the whale. I’ve known for a long-time now how inhumane and brutal harpoons can be, but I was not prepared for what that footage revealed. Horror isn’t a strong enough word to describe it. More than anything, I was deeply disappointed in my government for knowing that this was happening in our protected waters and did nothing to directly intervene for almost a decade whilst this incredibly cruel poaching of whales continued. I have been involved with Sea Shepherd Australia as a volunteer for around 5 years. I am the National Music Representative and love working with the strong, outspoken voices of different generations fighting for our oceans. Along the east coast, there are now hundreds of eco-tourism businesses that thrive off the thousands of whales that cruise past our beaches. Australia has some of the most unique marine ecosystems that you can’t find anywhere else in the world. Why would you allow anyone to illegally enter Australia’s precious Maritime Zones, particularly the Southern Ocean Whale Sanctuary, to risk that? I would really like Prime Minister Turnbull, and my Member of Parliament, our Border Protection Minister, Peter Dutton, to discuss this important issue with Japan and to send an Australian Customs vessel to put a stop to this cruelty now! These are our waters and those are our whales. Sea Shepherd is a non-profit conservation organisation whose mission is to end the destruction of habitat and slaughter of wildlife in the world’s oceans in order to conserve and protect ecosystems and species. Sea Shepherd uses innovative direct-action tactics to investigate, document and take action when necessary to expose and confront illegal activities on the high seas. By safeguarding the biodiversity of our delicately balanced oceanic ecosystems, Sea Shepherd works to ensure their survival for future generations.